Haiti: Is Medical Care Really Better Now? Goldman Sachs (Pt 3): "Jokers to My Right"
Goldman (Pt 2): "The Crucible"
Goldman (Pt 1): "Clowns to the Left of Me"
True US Unemployment: 20% and Rising. 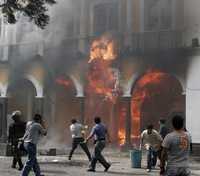 The new year is already off to a turbulent start in Bolivia. During the week of January 7 to 15, up to six thousands supporters of President Evo Morales' MAS party-- mainly cocaleros from the Chapare coca-growing region, campesinos, and indigenous groups -- showed up uninvited in Cochabamba, Bolivia's third largest city of 800,000, in the country's center. They had come to demand the resignation of Cochabamba's right-wing Governor, Manfred Villa-Reyes, who has become an outspoken leader of the "autonomista" movement since his election in December 2005. This movement is seeking greater "states rights" for the country's nine provinces, especially the wealthier, whiter provinces of Beni, Pando, Santa Cruz, and Tarija in the south and east, where most of Bolivia's natural gas and richest farms are located. As shown in the accompanying exclusive video footage from Cochabamba (Parts I, Part II). shot by Bolivian film crews working under the direction of Donald K.Ranvaud (Constant Gardener, City of God, Central Station, etc. 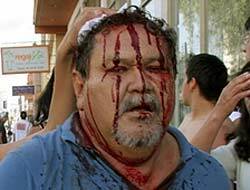 ), the MAS supporters encountered a fierce reaction from the city's middle-class residents and pro-autonomista forces. These included a crowd of more than 1000 well-organized stick-waiving militants who attacked the cocaleros and campesinos aggressively on January 13th. In the ensuing conflict, at least two people were killed and more than 150 were injured. By Saturday January 14th, calm had returned. Manfred came back from Santa Cruz, where he had fled out of fear for his own safety, and Morales returned from Nicaragua, where he had been attending Daniel Ortega's Presidential inauguration. Steps were taken on all sides to pacify the situation -- including the deployment of the Bolivian Army. However, as we'll discuss below, the potential for renewed conflict is very high. This is not only because none of the fundamental economic and political causes of the conflict have been addressed. It is also because Bolivia's political leaders on all sides have not exactly shown the maturity and capacity for compromise that will be essential to avoid a "lose-lose" outcome. Regional tensions have been building up in Boivia for several decades. The potential for conflict is explosive because it is closely aligned with many other deep-seated social fault-lines – the distribution of natural wealth; poverty and education; the concentration of organized communities like the cocaleros, indigenous groups, and obreros; and the distribution of support for parties and organizations like PODEMOS, Manfred Reyes-Vlla’s NFR, and “Nacion Camba” on the Right, and MAS, the cocaleros, the campesinos, the Central Obreros, and the social movements on the Left. One crucial factor is that Bolivia’s most valuable natural resources, arable land and natural gas (and the refineries, pipelines and agribusiness facilities needed to exploit them), are concentrated in Bolivia’s wealthier eastern and southern states. Together Tarija, Santa Cruz, Beni, and Pando account for just 30 percent of Bolivia’s population, but more tha two-thirds of its natural wealth. While MAS has captured a third of the vote in Santa Cruz, Evo’s poorer, more indigenous (“Kolla”) base is much stronger in the five western states. In the state of Cochabamba, a key battleground in the recent crisis, Evo’s party controls 12 out of 14 provinces, and has been pressing hard to oust Manfred. The regional conflict has recently come to a head for several reasons. First, since Evo's election in December 2005, he has been asserting greater federal control over land, natural gas, and tax revenues. 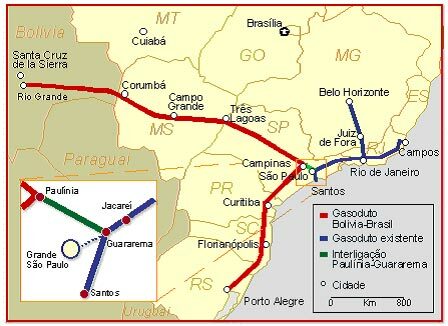 He has also renegotiated Bolivia’s gas export contracts with Brazil and Argentina, tripling the revenue that the country realizes from its gas exports. Under Bolivia’s current federal system, at least 40 percent of this increased revenue will go to the states. Ironically enough, the “Camba” states –- which were heavily subsidized by the “Kolla” ones before gas and soybeans took off in the 1970s and 1980s -- have benefited greatly from MAS’ new economic policies. But this has not led them Camba states to support Evo – if anything, it has increased their desire for secession. Evo has also launched a tough new anti-corruption campaign – one of the most aggressive in Latin America. Focused on increased transparency and accountability for government spending, this is intended to address the long-standing popular conviction that a large share of Bolivia's Treasury ends up benefiting powerful private interests. It is also designed to insure that any increased gas revenues will be used wisely. The program is very popular with ordinary Bolivians, but it has not won Evo many friends among the state bureaucracies, the diplomatic corps, and politicians – for example, Governors like Manfred, who has often been accused of corruption, and of being a lackey of former President Goni Sanchez de Losada -- whose extradition from the US on "genocide" charges is about to be requested by Evo's government. Third, in August 2006, Evo convened a “Constituent Assembly” to rewrite Bolivia’s constitution – a key MAS promise to its followers. But when the delegates to the CA were elected, MAS failed to win the 2/3rds needed to control it. So the CA has bogged down in procedural fights, with PODEMOS and other center-right parties blocking efforts to permit majority rule. Finally, in response to these MAS initiatives, the autonomistas have recently become much more aggressive and well-organized – some say, with outside support. Key politicians on the Right (especially “Colonel” Manfred) have seized the opportunity to make a national name for themselves. 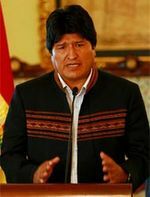 In July 2006, Bolivia held a national referendum on whether to grant more power over revenues and spending to the country’s nine departments. The autonomistas lost by a wide margin. 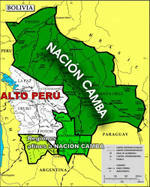 Despite this, in December 2006, six of the country’s nine governors -- including Manfred, the four Camba state governors, and Jose Luis Paredes, La Paz’ non-MAS Governor -- met in La Paz and demanded yet another (very costly) referendum on autonomy. This triggered the massive confrontation noted above. Encouraged by Evo -- and perhaps also aided by support and organization from Venezuela -- more than 6000 of Evo’s supporters assembled in Cochabamba to demand Governor Manfred’s resignation. Many of his middle-class supporters stayed behind and engaged in sharp street battles with the cocaleros. Their included a band of more than a thousand stick-wavers militants who attacked the cocaleros with paramilitary-like discipline. At least three of those arrested were carrying guns and long knives. No one emerges from this conflict with clean hands. On the Left, key leaders like Oscar Olivares and Edgar Patano have supported the use of mass demonstrations almost as if the MAS could not rely on normal legal and electoral processes. 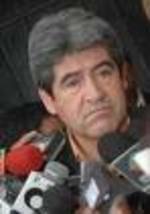 Evo failed to discourage his supporters from occupying Cochabamba, despite the fact that Manfred had also been legally elected in 2005, and that while his call for a second referendum was provocative, it was not illegal. Once the conflict started, Evo also took his time returning from Ortega’s inauguration. 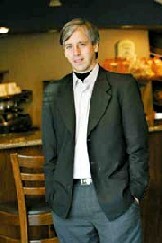 He didn’t arrive in Cochabamba until January 14, after the violence had subsided. 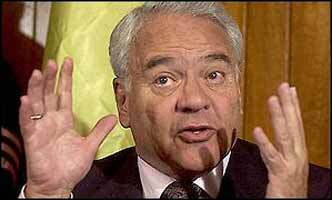 Once there, he didn’t advise his followers to disband or retract their demands for Manfred’s resignation. On the Right, the autonomistas and their political allies, especially Manfred, Paredes, and the four Camba governors, have also been provocative. Their demands for separatism and another regional referendum, as well as their refusal to compromise on CA voting procedures have been incendiary. Even more disturbing, the willingness of autonomistas to organize armed groups to attack MAS demonstrators indicates the potential for escalation. There are now signs that both sides in this conflict are attempting to step back from the precipice, at least for the moment. With the Bolivian Army’s help, peace has returned to Cochabamba. Manfred has withdrawn his call for a second referendum. As a way of defusing the demand for his resignation, MAS has introduced an emergency bill in Congress calling for a referendum revocatorio. This would require Bolivia’s elected officials -- mayors, governors, ministers, and even the President himself – to submit to referenda on their performance if they are accused of corruption, mishandling cash, human rights violations, or the failure to fulfill electoral promises. Evo’s Vice President, Alvaro Garcia Linares, has reaffirmed Manfred’s authority and offered to guarantee his safety. Still, demands for the resignations of Manfred and Paredes have continued. 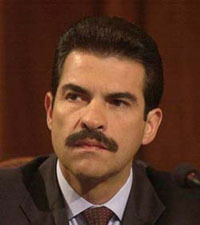 Paredes has threatened that he and all the Camba state governors would all resign if Manfred were ousted. While peace has been restored, thousands of social movement activists are still very agitated. Overall, the situation remains a power keg, with social peace owning a great deal to the continued presence and neutrality of the Army. While a full-scale civil war has been averted for the time being, this could easily turn out to be a classic “lose-lose” situation -- especially if extremists on the Right and Left abandon their commitments to democratic procedures. The sharp escalation of this conflict in early January underscored the immaturity of Bolivia’s political leadership and the precarious state of its democracy. On the other hand, as is often the case when decisive historical turning points are reached, this crisis might just possibly turn out to be constructive. Bolivia’s leaders can seize the moment and achieve breakthroughs on key issues like revenue-sharing, corruption, the Constituent Assembly, and the role of popular referendums, they may be able to achieve political innovations that will be of great interest to other Latin America democracies -- and the rest of us. After all, despite centuries of oppression and brutal class conflict, Bolivia is one of the few countries in the Americas that did not kill off its indigenous majority. Unlike other Latin American countries like Peru, Colombia, El Salvador, and Guatemala, Bolivia has also managed to avoid extreme social violence and civil war. We are hopeful that Bolivia's exceptionalism in this regard will be maintained. But it could be sorely tested in the weeks and months to come. J.S. Henry: The Blood Bankers. J.S. Henry (Ch 7: Debt Relief): A Game As Old As Empire. P. Starr, R. Bonner, J.S. Henry: The Discarded Army: Veterans After Vietnam. Banqueros Y Lavadolares. J.S. Henry. (Bogota: Tercer Mundo, 1996). Redeeming Features. Denis Beckett. (2004).